Ex-buyer turned trend specialist turns amateur sleuth. She designed her future with couture precision, but finding the fashion director's corpse on day one leaves her hanging by a thread. And when the killer fabricates evidence that puts the cops on her hemline, even a chance run-in with hot shoe designer Nick Taylor can't keep her life from unraveling. 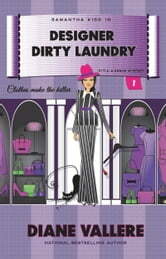 She trades high fashion for dirty laundry and reveals a cast of designers out for blood. Now her job, her love life, and her future are put on hold as she tries to expose a diabolical designer before getting marked down for murder. This is a quick fun read. This is the first book in the series so there is a lot of explanation. Some of the amateur sleuth's antics did get on my nerves by the end of the book. This was one of those books you keep yelling at and you solve long before the sleuth. I hope she learns from her mistakes and solves the next murder a little smarter.